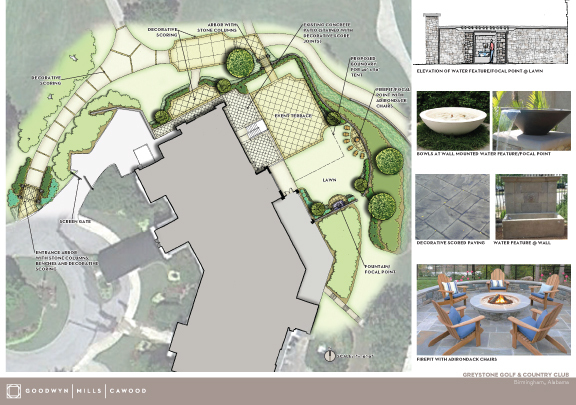 Greystone Country Club needed to expand on their outdoor spaces to meet the need for parties and events. A terrace developed adjacent to the indoor dining facilities was a great location for existing facilities and featured an incredible view of the surrounding hills and golf course. Work on the terrace included preparing a space that could be entered through the build or around the building with a separate path leading to parking. The terrace was designed to accommodate weddings with a special gateway feature for guests and wedding party to pass as well as parties with outdoor tents if needed. The terrace features a fountain focal point with the gateway, outdoor seating with fire bowls, and landscaping that frame the beautiful views beyond.